PMC Helper recruitment 2018. 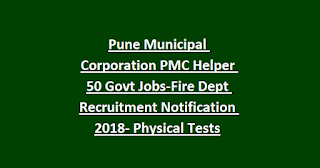 Pune Municipal Corporation Helper vacancies selection will be based on physical tests. Those who are having 6 months fire services training certificate they are only eligible for this Pune PMC Helper jobs. Last date to reach the application form to Pune mahanagarpalika is 27-11-2018. 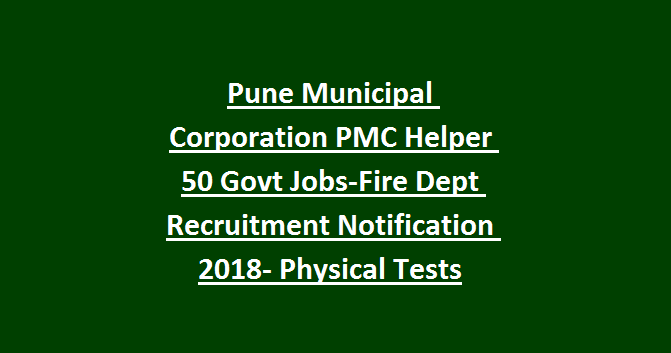 Physical test details, application form, age limits and other details are given below for this PMC Fire Dept Helper jobs recruitment 2018. Last date to submission of application form is 27-11-2018. There are total 50 Helper posts in this PMC jobs. Age limits are 18-38 years for this Helper jobs. Reserved candidates upper age limit is 43 years. Candidates who are having 6 months Fire Training Certificate they are eligible for applying this PMC Helper recruitment 2018. Application fee is Rs.100 for this Helper posts. Candidates selection will be based on physical tests, interview. Download application form through official website of www.pmc.gov.in. Last date to reach the application form to PMC Fire department is 27-11-2018.